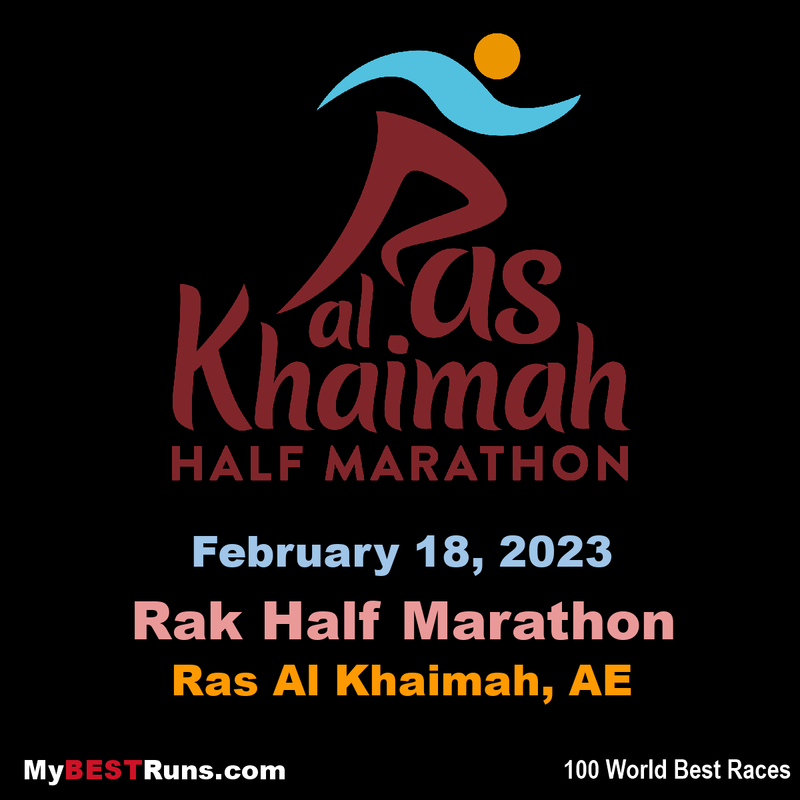 The Ras Al Khaimah Half Marathon is the 'world's fastest half marathon' because if you take the top 10 fastest times recorded in RAK for men (and the same for women) and find the average (for each) and then do the same with the top ten fastest recorded times across all races (you can reference the IAAF for this), the faster average time for both men AND women will be in RAK; making it the world's FASTEST half marathon! Haftu finished third in 59:08 while Wanders placed fourth in 59:13, taking nine seconds off Mo Farah’s European record. 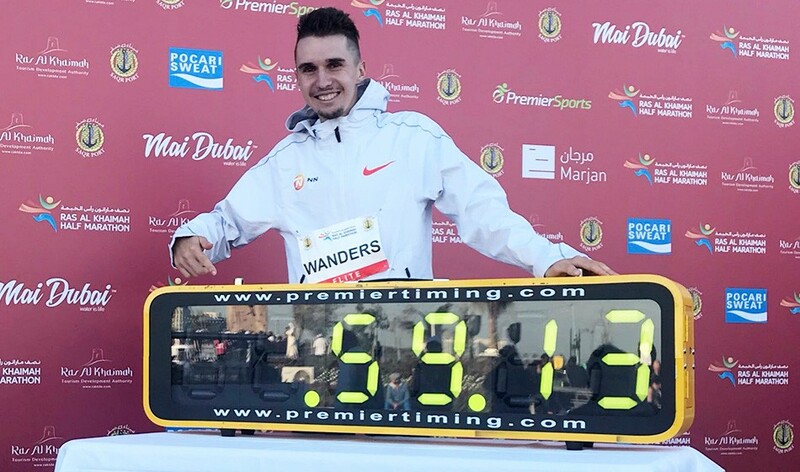 In fifth place, Gachanga matched his finishing position from last year but was rewarded with a PB of 59:22. The course will start and finish at the same place on Al Marjan Island, opposite the DoubleTree by Hilton hotel. 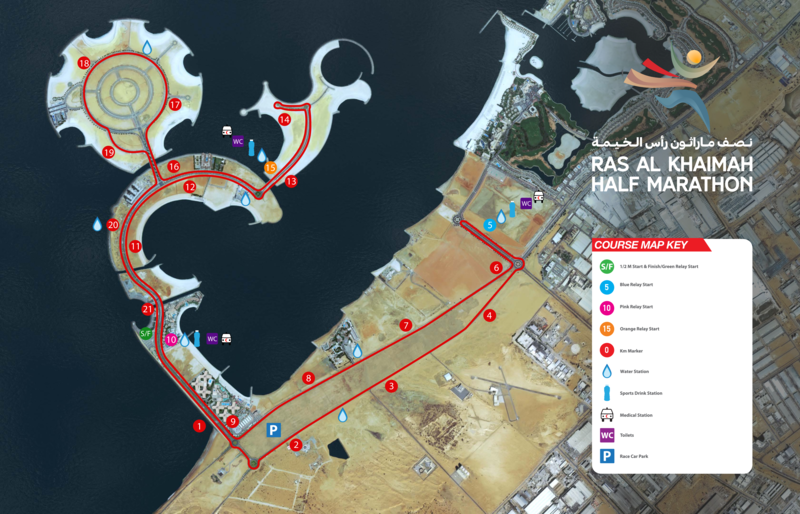 The course heads initially off-island and directly across to the E11, heading north bound to Al Hamra Roundabout (where everyone coming from the south would have arrived from) where it turns left (3rd exit) for a short run along the brand new access roadto Al Hamra Village Hotels. A U-turn around the first roundabout(~5km)will have you running back towards Al Hamra Roundabout but this time the sweeping right slip road will lead you back to the E11 south bound at approx 6km marker. Just under 3km later a second sweeping right hand slip road will lead you back on to Al Marjan Island for the remainder of the course. Passing by the Start/Finish line (across to your left) you'll pass the 10km marker (and 2nd Team Relay Station) as you head further 'out to sea' passing the Marjan Island Resort & Spa on your left before reaching the furthest point of the main island and crossing over for a quick out and back visit to Island 3. A return to themain island is with yet another sweepingright hand slip road, back past theMarjan Island Resort & Spa (~16km) and another of the smooth sweeping right hand turns on to Island 2. An anti-clockwise run around this island will check off a further 3 and a bit km as yet another sweeping right hand turn (!) brings you, for the last time, back to the main island and past the 20km point with the final homestretch clearly marked - don't forget to speed up a bit if you can when you reach the final (21km) marker as the finish line will be just around the curve!